Last week featured the nightmare that every social media manager, community manager, and social media customer service professional fears. Southwest Airlines experienced a massive technology failure, rendering huge portions of their computer systems inoperable for more than 12 hours. To get back on track, the airline cancelled nearly 2,000 flights causing a four-day tsunami of customer frustration. The magnitude of the issues were nearly unprecedented in American aviation, and the computer outages left airport personnel able to receive only minimal communication from corporate, causing huge inconsistencies in what passengers were told, and how they were treated. Some passengers got hotel vouchers, others did not. Some passengers were kept informed, others were left to fend for themselves. Southwest’s customer service, social media, and operations teams were besieged by the red hot anger of some 250,000 irate passengers. How did they do, and what can we learn from how they handled this extraordinary social media crisis? I’ve been watching their moves closely, and I’ve identified 6 social media crisis lessons. 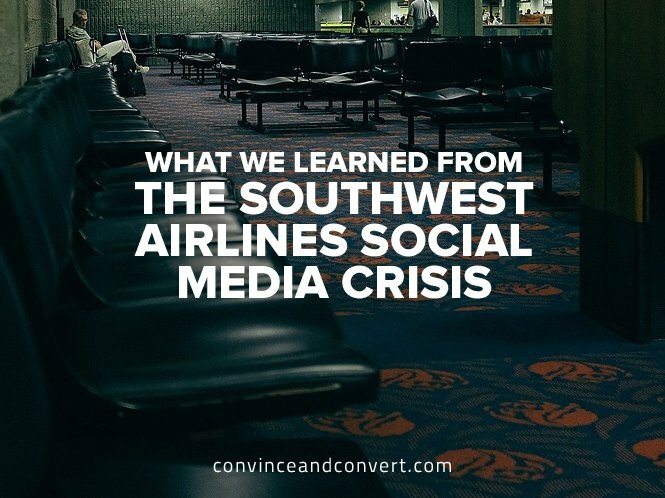 From the very beginning, the Southwest online representatives took complete ownership of the crisis, and apologized (with evident sincerity) to customers at every turn, both in social media and in explanatory content. This may seem self-evident and trivial, but it’s not. Many companies forbid their social media customer care teams from apologizing for anything in a public forum, believing it opens the company to legal liability down the line. There is no factual basis for this, as I uncovered in my book, Hug Your Haters. Yet, it’s not at all uncommon for companies to dance around the issue, even when they are clearly in the wrong, and refuse to apologize. In any customer service scenario, humanity is key. It is much harder to be mad at a person – any person – than it is to be made at a company or brand. Southwest took an innovative and effective approach to humanization through the use of Facebook Live video to keep customers informed and to underscore apologies. The star of these videos was Brooks Thomas, who I interviewed on my Social Pros podcast in happier times. (It was a great episode, and I encourage you to listen to it). But it wasn’t just Brooks (who pulled all-nighters with his team trying to keep up with customer complaints) on Facebook Live. In the example above, the company’s Chief Operating Officer explained the current status, adding significant credibility to the video. The videos worked, at least as measured by emoji sentiment. The live broadcast above was watched 803,000 times (Wow! ); was liked more than 5,500 times; was loved more than 1,100 times; and solicited a comparatively paltry 650 angry emojis. This may go down in the social media text books as the first big-scale use of live video in a social media crisis. We will see more – a lot more – of this in the future. In my first book, The Now Revolution, Amber Naslund and I wrote that the best way to handle a social media crisis is to create an online hub that contains all information and company responses about the situation, and to link to that hub in social media responses. This strategy was employed as recently as 90 days ago when Starbucks created a massive kerfuffle by changing how points are accrued using their popular rewards card. In that crisis, Starbucks launched a dedicated microsite and FAQ about the changes, and referred unhappy customers to it, following The Now Revolution playbook almost exactly. But Southwest Airlines has shown this approach is no longer sufficient. Customer attention is too fragmented and online channel proliferation is too real. Southwest did post its written apology to its own discussion forum, but also posted the same content directly to Facebook as a note, and also on Linkedin. This is wise and on-trend, as Southwest realized that customers on Facebook are there for a reason, and neither want (nor need, via the use of Notes) to click over to the Southwest website to read an apology and explanation. I predict this type of multi-channel crisis communications will also become the norm. As set forth in my book, the Hug Your Haters approach dictates that you answer every complaint, in every channel, every time. Whether it was a strategic decision, or perhaps more likely a situation where the volume and speed of complaints was simply too enormous, Southwest did not answer them all. They answered many, on Facebook and Twitter in particular, but many custom complaints and pleas for information were not addressed. The inconsistency of response compounded hurt feelings in some cases, and also created some channel shifting among customers seeking a place where they could be answered. Echoing Lesson 3 above about channel proliferation and customer preference, it is fascinating that Southwest’s Facebook page received thousands of customer complaints. The discussion board thread about the outage on Southwest’s website received a total of 39 replies. While Southwest wasn’t able – or willing – to answer every customer complaint, those they did address were handled with stunning swiftness, given the circumstances. Twitter complaints that received a reply were mostly handled in three to 12 minutes, and Facebook responses within 45 minutes. 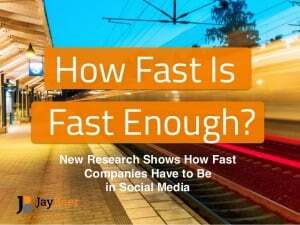 This is also on trend, as my study with Tom Webster and Edison Research found that 40% of the social media complainers who expect a response from brands expect that response within 60 minutes. It’s safe to say that just about every customer expected a response in this case, so doing so within an hour is quite a feat for Southwest, given the deluge. It would have been better to answer them all, but answering fast at least helps placate the customers they could respond to during the crisis. As noted above, Southwest took an overt, multi-channel approach to handling this social media crisis. The crisis was never mentioned on Instagram, however. The brand is active on Instagram, with nearly 250,000 followers on that channel. Perhaps because they believe Instagram is a platform for feel good, behind-the-scenes storytelling (according to Brooks in his podcast interview), the airline chose to not apologize or make any reference whatsoever on Instagram. 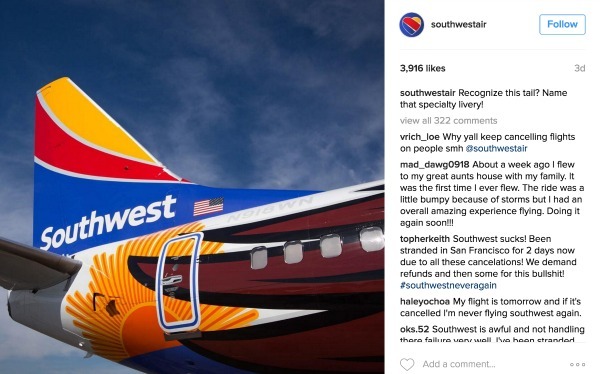 Southwest’s most recent Instagram post has received 322 angry comments, with zero response or acknowledgement from the company. Ouch. Remember that it doesn’t matter if the company thinks of a channel as a “customer service channel.” If the organization has a presence in an online venue – even it it’s usually just marketing and communications content – customers will expect to be able to communicate with the company on that venue in a crisis scenario. With messaging apps and Snapchat coming online as potential customer service outlets too, the channel proliferation problem is going to get even more acute for businesses. You can no longer assume that ANY channel is non-viable as a customer contact avenue. I’m a fan of Southwest. They’re good to me when I fly, and I’ve enjoyed working with the brand on the business side as well. I’m truly sorry this crisis occurred – for the many, many affected passengers, and for the company. All-in-all they did a commendable job of handling it in social media, and I hope you never forget these lessons, which are applicable in almost every social media crisis scenario.